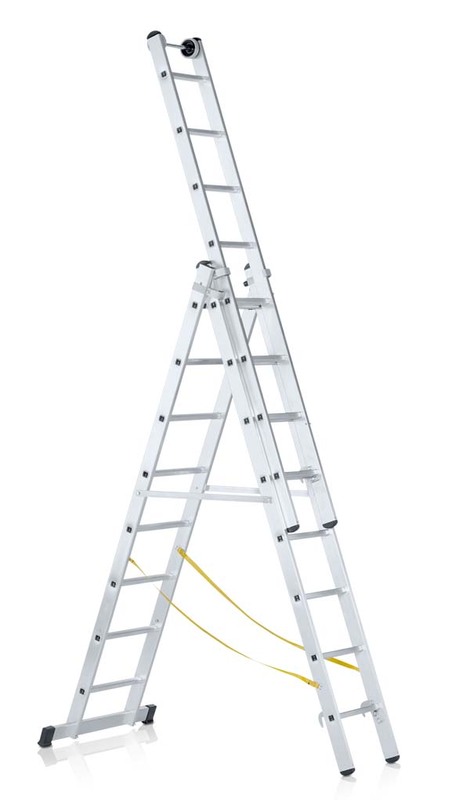 One Ladder with up to six functions. Can be used on steps and stairs. Upper ladder can also be used separately as a single ladder. Upper ladder with rung hooks and locking tab. Strong Perlon straps. Sturdy bolt-on fittings made from extruded aluminium sections. Optimum wrap-around stile guide that encompasses the whole rung. Rung lock and guides are bolted in so that they can be replaced. Strong ZARGES quality flanging connects rung and stile. Replaceable 2-component plastic end caps ensure positioning without the risk of slipping and at the same time provide firm seating in the stile. Rungs and stiles made from extruded aluminium sections. Wide horizontal stabilizer bar. One rigid locking bar.